The UK government continues to pursue military solutions to security questions. The government claims that arms exports are 'managed responsibly'. Yet the UK routinely supplies regimes that have appalling human rights records and countries in conflict. Every year, the UK Government authorises the sale of arms to over 100 countries across the globe. This is hardly surprising given that it is government policy to promote arms exports. In 2008 the Government opened the Defence & Security Organisation (DSO) in the UK Trade & Investment department, which promotes weaponry on behalf of arms companies. The number of civil servants promoting arms sales is completely out of proportion compared to the number of civil servants promoting other export sectors. The Government asserts that it is effective in ‘controlling’ arms exports but continues to license exports to countries with terrible human rights records such as Saudi Arabia and Egypt. The Government has supported arms exports to both sides in areas of tension such as China and Taiwan, India and Pakistan, Russia and Georgia, Greece and Turkey, and arms company MBDA supplied weapons to all three sides in the conflict in Libya in 2011. In recent decades the UK government has licensed arms sales to several countries with which it has then gone on to have conflicts with. UK arms were supplied to Argentina before the Falklands War, to Saddam Hussein’s Iraq before the Gulf War, and to Colonel Gadaffi’s Libya before the UK joined the NATO bombing campaign in 2011. Military spending now comprises 6 percent of government expenditure. This is a much lower proportion than before the First World War, mainly because of increases in other government spending such as health and education. Nevertheless, the UK still has the sixth highest military spending in the world and since 2010 the Ministry of Defence has faced much smaller cuts than most government departments. Moreover, the UK’s military expenditure, which currently stands at £39 billion a year, is almost twice the £19 billion a year that the UN estimates it would cost to solve global food insecurity. While the benefits of the arms trade accrue to international companies, the costs are to the people on the receiving end of the weaponry, the citizens and taxpayers of both buying and selling countries, and to national and international security. It is not surprising then that, just as at the time of the First World War, many people oppose the production and distribution of weapons. In 2014 a shipment of 1.6 million rounds of teargas, destined for Bahrain, was stopped following an international campaign involving CAAT, Bahraini human rights activists, and South Korean anti-militarist groups. 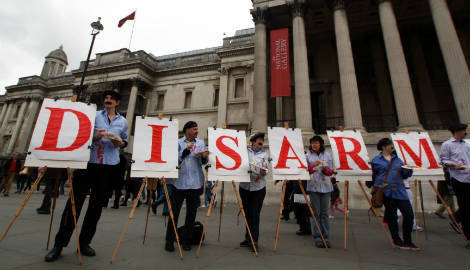 In 2013 CAAT organised large-scale protests and non-violent direct action against the London arms fair resulting in a week of disruption for the arms dealers attending. Entrances to the arms fair were blocked for hours with military equipment turned away, arms company Lockheed Martin’s offices were locked down, and two arms dealers’ dinners were disrupted by protesters. In 2012 the National Gallery’s sponsorship by an arms company was ended following a 6 month campaign by CAAT. Guildford Cathedral then cancelled its hosting of an arms dinner. In 2011 the committee of MPs which scrutinizes arms exports acknowledged the contradiction between the Government’s stated commitment to human rights, and its continued pushing of arms exports to human-rights abusing regimes. In 2008 the previous owners of the London arms fair, Reed-Elsevier, were forced into selling up after pressure from shareholders concerned about hosting such an unethical event. In 2007 the government’s arms promotion unit, the Defence Export Service Organisation, was shut down following a long campaign by CAAT. Unfortunately a new, but smaller, arms promotion department was set up in 2008. If you want to get involved in CAAT’s campaigns visit https://www.caat.org.uk/get-involved/join-us/. This widespread concern about the UK’s arms trade is actually recognised by many parliamentarians. In 2013-14, 81 MPs signed a Parliamentary petition to stop UK Government promotion of arms sales to human rights abusing regimes. There is increasing understanding that arms do not lead to security. Indeed, the Oxford Research group, which works to promote the concept of a more sustainable security approach, has identified three primary threats to peace in the 21st century: climate change, increasing competition over resources and inequality of wealth. The danger of rising temperatures was also underlined in a recent study by the UK’s Ministry of Defence which called climate change a ‘driver that is so pervasive in nature and influence that it will affect the life of everyone on the planet over the next 30 years’. One wonders then how more militarisation and investment in arms will help us face these global challenges. The money and skills wasted on arms would provide greater security and economic benefits if they were invested in addressing real security challenges such as climate change. It is vital to counter the arms trade’s myths as well as to highlight the pain and destruction it causes. Vickers and Armstrong, the two largest UK arms companies during the First World War, were both eventually absorbed into what is now BAE Systems, the UK’s largest arms company and the primary recipient of government military contracts. Today arms industry jobs are presented as being vital to the UK economy despite being in decline for many decades. The numbers of arms industry jobs, though substantial, are inflated by government and industry. The arms industry is stagnant and has no potential to boost the economy. The large amounts of public money thrown at it are wasted as well as damaging, whereas they could be used to support other sectors with vastly greater potential and provide more and better jobs producing useful products. As the money that supports the arms industry is public, this money can be redirected. There is a science and engineering skills shortage which means that the arms industry is holding back other sectors of the economy. It also means that arms workers are more likely to find work relatively easily even without targeted public investment. Arms companies such as BAE Systems wrap themselves in the Union Jack and talk about British jobs in their PR here, but this is purely tactical. They have little real commitment to UK workers and employ as many workers in the USA as in the UK. There are better jobs for arms industry workers. The vibrant renewable energy and low-carbon sectors are being held back by skills shortages and a lack of investment and political support. These sectors could realise many more high-skill jobs and far greater economic benefit than the arms industry, while also producing vital environment and security benefits. You can read more about CAAT’s campaign to shift from arms trade jobs to renewables here.